Very nice mag pouches. Easily adjustable to fit whatever mag you have. Well built. Excellent product. The unique retention system that all DAA pouches utilize has made the Racer Pouch a very popular choice for competition shooters worldwide. However, to make it suitable for IDPA use, some changes and new features were required. 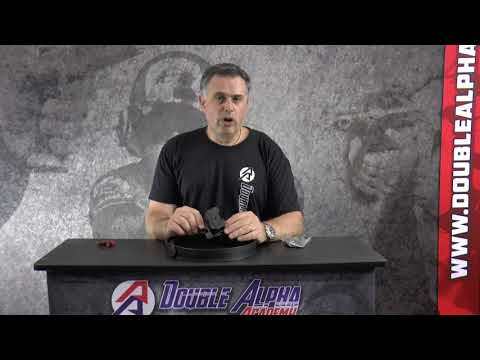 The IDPA Racer Pouch utilizes the same tested and proven Racer Pouch body on an entirely new hanger that allows the slide-onto-belt functionality required for IDPA competitors. The hanger is designed to position the pouch closer to the body, making it suitable for IDPA, but also with an eye to the carry and self-defense markets. 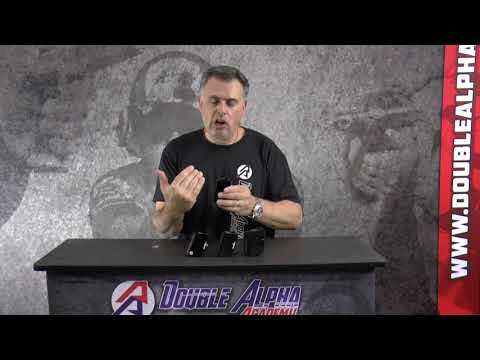 The thumb-adjustable wheel is removed to meet the IDPA rules. Tension adjustment is still possible by means of a pressure screw that can be turned with a hex key, accessed from the back of the pouch body. The IDPA Racer Hanger is ideal for threading onto medium to thick belts with a width ranging from 1.5” to 2.25” (39 mm to 57 mm), using a set of included click-in spacers. For each belt width use the appropriate spacers to get a solid and secure fit. Interchangeable pouch inserts allow you to go from larger 2011 mags to smaller CZ/Tan mags. A third pressure spacer is included for Glock and M&P mags. A single stack spacer is also available as an accessory. The pouch is completely ambidextrous, allowing easy mounting for left-handed or right-handed users. You can even mount the pouch at 90 degrees away from the body if you prefer “bullet-out” carry (not legal for IDPA use). You can adjust for tilt in very small steps, allowing you to find your preferred angle. Once the correct angle is set and the center screw tightened, the serrations in the connector piece lock up, preventing any rotation of the pouch until the center screw is loosened several turns. If you try to push them out forward or backwards, you will find them almost impossible to remove. The hanger is made of tough material and does not flex much. However, rotating them 90deg makes them come loose very easily. Hold one spacer at a time between you thumb and forefinger and rotate it 90degrees. Then allow it to fall out of the slot. Keep the spare parts safe, should you wish to use them later with a narrower belt. The Racer pouch portion works as well as any other versions. The belt loop attachment needs work however. The little sliding spacers do just that...they slide up and down too easily making installation on the belt too laborious. Since I like 1 spacer up and 2 down I have to hold them in position while threading my belt. This is even worse when straddling a belt loop for best position of the pouch. Some hot glue solves the problem but looks crappy and should not be necessary with a Double Alpha product. None of my other DA gear has required any modifications other than adjustments already designed into the products. Recently purchased a set of these new pouches for IDPA, Best pouches I've ever bought for IDPA because now when I switch weapon planforms I don't need to be looking for another set of mag pouches. I just adjust the tension to the new mags and I'm ready to go, Also belt size is no longer an issue; forget your belt & someone has a larger 1.75 or smaller 1.5 just take or add spacers & your good. Way to go Double Alpha for another amazing innovating product.